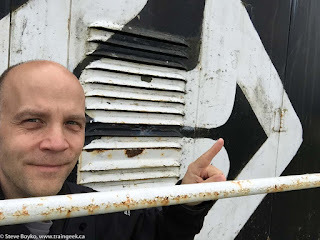 On our recent family vacation in Newfoundland, we saw the Railway Coastal Museum in St. John's and the Avondale Railway Museum. The first railway display we actually saw was the Whitbourne train station and display. The town of Whitbourne has a special place in the history of Newfoundland's railway, as it was founded as part of the original railway construction on the island and became Newfoundland's first inland town. Prior to the construction of the railway, there were very few inland roads on Newfoundland and communities were connected to each other by the sea. There was a great desire to diversify Newfoundland's economy beyond fishing, and therefore to develop the timber and mining resources in the interior of the island. The initial railway construction on Newfoundland was undertaken by a New York-based group known as the Blackman Syndicate or the Blackman Company. The railway was to be built from St. John's to Hall's Bay. Construction commenced in 1881 and foundered by the end of 1883 as the syndicate ran out of money. By this time the railway had reached Harbour Grace Junction, which eventually became known as Whitbourne. 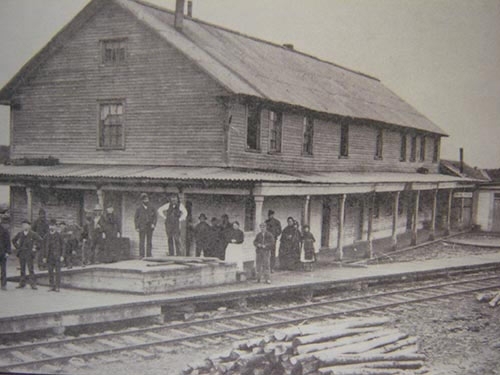 One of the first permanent buildings in Whitbourne was a combination station/hotel built by a Colonel Davenport. Whitbourne rapidly increased in importance as the first branch line was constructed to Placentia from Whitbourne in 1887. When the Reid Company took over the railway, it established its headquarters in Whitbourne and built car shops and other facilities there. Whitbourne's railway significance declined after the Newfoundland Railway moved its headquarters to St. John's, but it remained an important junction until near the end of the railway when the branch to Placentia/Argentia was closed. 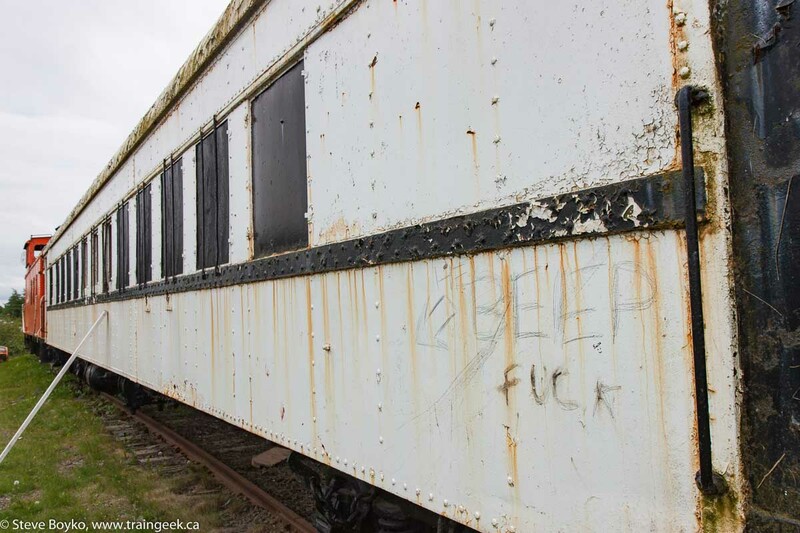 The quiet town of Whitbourne has a railway station, along with a collection of rolling stock. The station houses the town hall as well as a small museum. 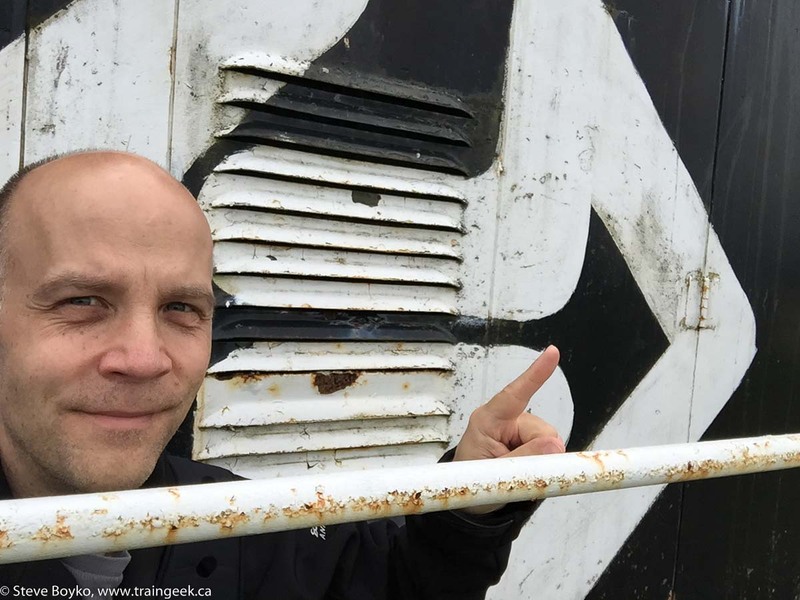 The town is a few kilometres off the Trans-Canada Highway. The station is a nice little building. I am not sure how old it is but it is clearly not the original station. It was closed up when we were there on a grey Sunday morning. The rolling stock consists of the ubiquitous snowplow, an NF210 engine, an express baggage car, a coach and a caboose. They are not in great condition, as you will see. 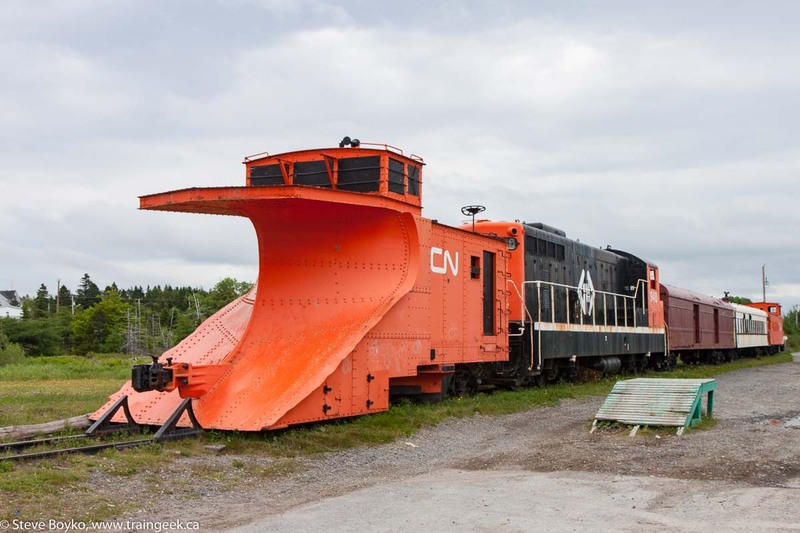 The snowplow is ex CN/TT 3459, built by National Steel Car (NSC) in 1953. Snow plows were very important on Newfoundland as the railway was plagued by significant drifts. At one time the railway had two rotary snow plows! As an aside, people on Instagram seem to love snowplows. The above photo was one of my all-time highest rated images on Instagram. 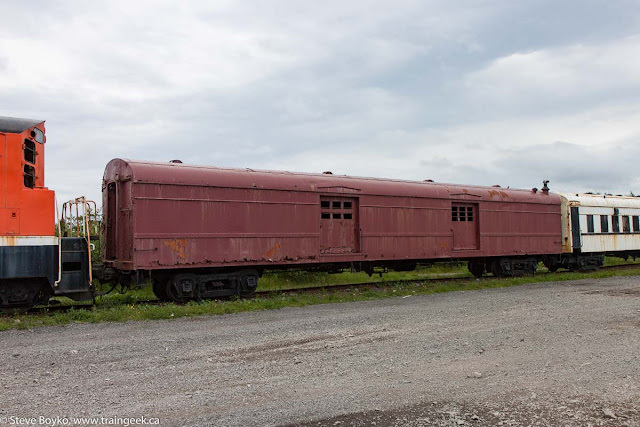 Terra Transport #940 was originally CN 940, built by GMD in February 1960 for Newfoundland's narrow gauge railway. 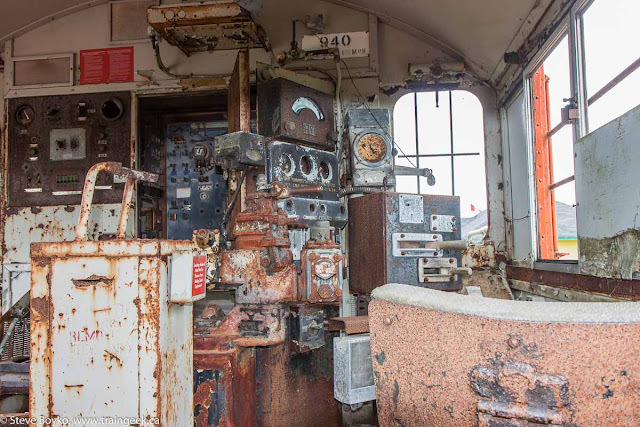 This locomotive is unfortunately exposed to the elements (and vandals) and its cab is not in good condition. 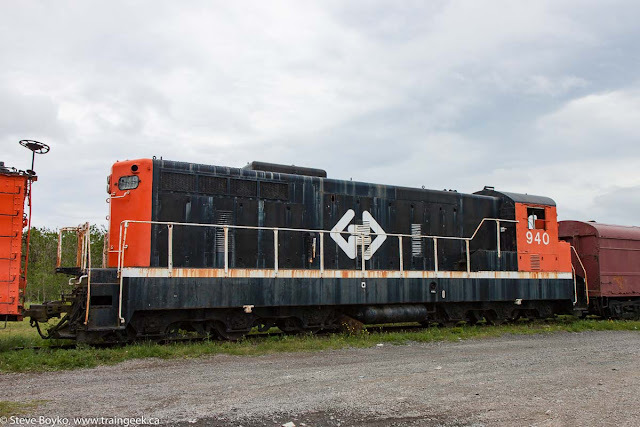 Only one of the display locomotives on Newfoundland still retains her diesel engine, CN 931 at Corner Brook. 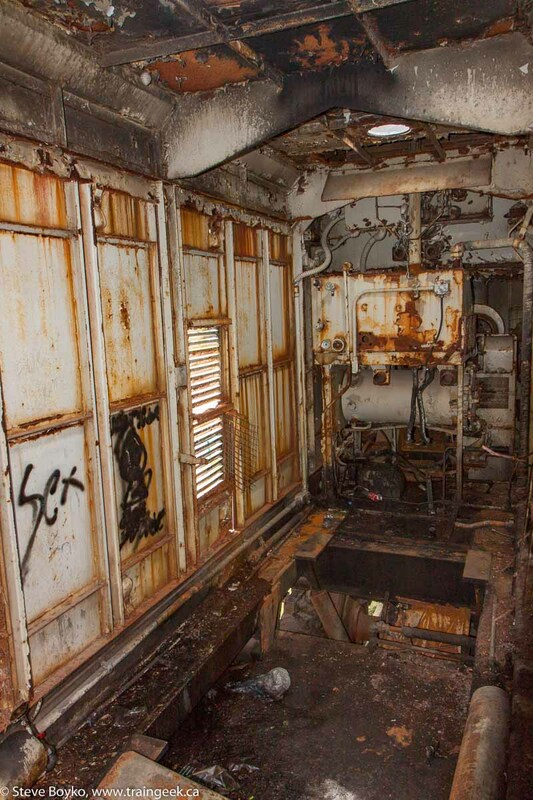 The hood doors were ajar on TT 940, showing the empty, graffiti-marred interior of the long hood. 38 of these NF210 locomotives were built, each with a 1200 horsepower prime mover. They were operated on the main line and on the Placentia branch, but were not permitted on the other branches due to the light rails still present. Six are preserved on Newfoundland and eleven were sold to other countries. I hope a few still soldier on in narrow gauge service elsewhere! 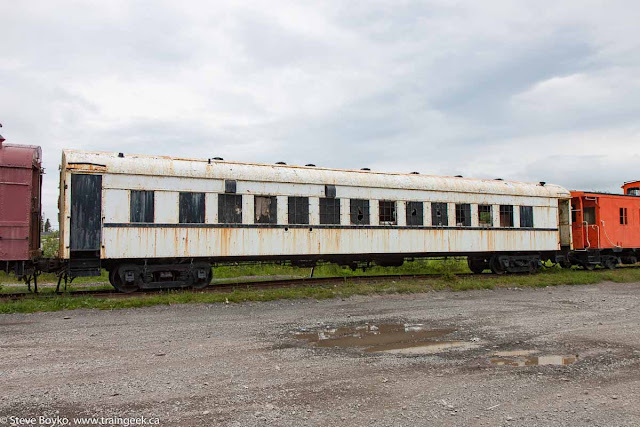 This unnumbered express car was built by the Canadian Car and Foundry company in 1943 as Newfoundland Railway #242. It was renumbered to CN 1602 and presumably continued to operate in passenger train service until it became CN Work Car 4147 in 1974. 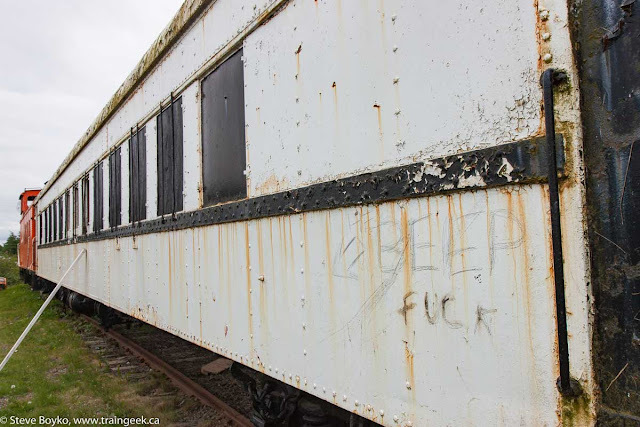 It continued as a work car until retirement in September 1989, almost a year after the closure of the railway on Newfoundland. This unnumbered coach was built by the Canadian Car and Foundry Company in 1943 as Newfoundland Railway #33. It had much the same history as the express car above. This car is really starting to show its age and the windows, although barred, are smashed in places. 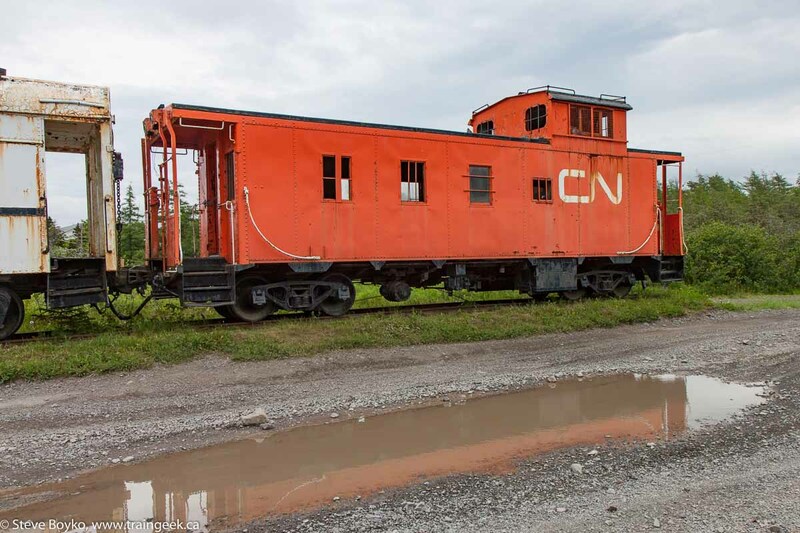 This caboose was built for CN as #6053 by National Steel Car. Whitbourne has a long history with the Newfoundland Railway and its successors, CN and Terra Transport. I hesitated to point out the condition of the display in Whitbourne. I know it is difficult to find dedicated volunteers and many railway museums struggle with funding and staffing. I hope that the town and interested persons can rally to maintain the station and rolling stock for many years to come.